After the Green Bay Packers disposed of the Detroit Lions on Thanksgiving day in a 34-12 rout, they were able to sit back and enjoy Sunday’s slate of NFL games. At 7-4, the Packers find themselves in good position to nab one of the two NFC Wildcard spots at the end of the season. They sport a decent conference record at 6-3, better than any Wildcard contenders other than the Eagles (6-2). 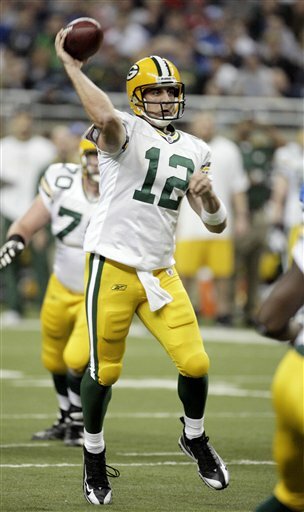 Still, the Packers were looking for a little extra help this weekend from some of the bottom teams in the NFC. Unfortunately, things did not go as planned. Here’s a look at the Packers’ situation and reviews of how each Wildcard contender did this past weekend. The Packers play the Ravens and Steelers over the course of three weekends and, while it looked more difficult at the beginning of the season, both games will be difficult. Both teams sit at 6-5 and are very beatable, especially the Ravens at home and the Packers will most likely need to take one of them to keep their playoff hopes alive. If they lose one of those games, the good news is it will not count against their conference record, the first tiebreaker in determining the Wildcard spots. They also play two games in which they should be favored against the Seahawks and Bears. To close the season out, they go to Arizona to play the Cardinals. The caveat there is that the Cardinals, who hold a two-game lead on the division, could very well have wrapped up the NFC West by then and will be resting their starters, making for a much easier game. The Cowboys were sure thankful for whoever scheduled them to play the Raiders on Thanksgiving Day. America’s Team pummeled the Raiders 24-7 and now find themselves in the driver’s seat to win the NFC East at 8-3. Someone has to win the NFC East by rule, but Packers’ fans were hoping that it would be the Cowboys vying for a Wildcard spot due to the head-to-head advantage they hold against them from the Week 10 victory in Lambeau Field. The Eagles sit at 7-4 and are still very much alive in the NFC East hunt, but instead of worrying about tie-breakers and conference records and such, it would be best if the Cowboys won the rest of their games, including match ups against the New York Giants and Eagles. Their schedule the rest of the way is tougher than their NFC East counterparts, but they should win the East if they win their division games. 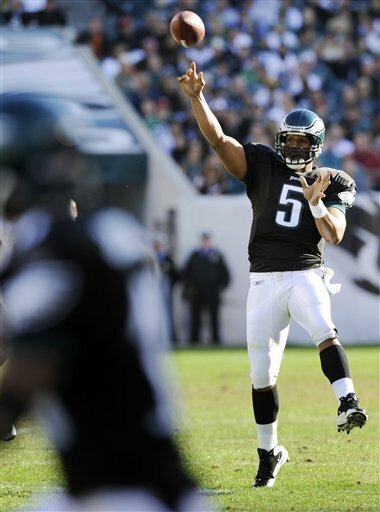 If it weren’t for some 4th quarter heroics from Donovan McNabb, the Eagles would have been looking at a 6-5 record and a 2-game difference in the NFC East. They trailed the Redskins by eight points in the fourth quarter but ended up winning the game in the last two minutes, 27-24. It would have been a huge gain for the Packers if the Eagles had tripped up, but alas they pulled it out. The Eagles have a better conference record than the Packers because they have played one less game and do not play the Packers head-to-head. They will face Atlanta next weekend who is also fighting for their playoff life as well as the Giants and Cowboys, so chances are the Eagles will either knock out one of the NFC East opponents or be knocked out by one of them. After beginning the year 5-0, the wheels are starting to come off for Eli Manning and the Giants. They missed a golden opportunity to stay tied with Philadelphia and within a game of the Cowboys, but dropped their Thanksgiving Day match up against the Broncos, 26-6. They face the Cowboys next week who they already beat in Dallas, meaning they could have taken possession of first place had they won last week. However, a win in Dallas would not only keep their playoff hopes alive, but their division hopes alive as well. The next week they play the Eagles, meaning that the next 14 days will all but determine the playoff hopes for the Giants. If they win both, they will be in very good shape to win the division. Lose both and they will probably be on their couches for the second season. The Falcons were about 30 seconds and one down away from seeing their 2009 playoff chances fade away, but a Roddy White touchdown catch to beat the Bucs 20-17 kept them alive in the hunt. They now sit at 6-5 and are still on the outside looking in, but face the Eagles next week in a matchup that, if won, would let them leapfrog the Eagles in the standings. After the Eagles, the Falcons play the Saints at home and then do not face a team with a record over .500 the rest of the year. Sounds good for them if they can beat the Eagles, right? Not so fast. Quarterback Matt Ryan and running back Michael Turner both left Sunday’s game with injuries and the offense will go nowhere fast, regardless of who they play, if the two of them can not go. They could sneak in the playoffs with a win over the Eagles, but keep a very close eye on those injuries. No one knows what head coach Mike McCarthy will say at his Thanksgiving Day dinner table, but you can bet that Charles Woodson and Donald Driver will be on his short list. The two veterans feasted on the young Detroit Lions Thursday as the Packers won their third straight game, 34-12 at Ford Field. It was the same story for the Packers once again, who used Driver and Woodson on both ends of the field to lead their team to victory. For Woodson, the task of shutting down Calvin Johnson was not going to be an easy one and looked to be a problem after Johnson scored from one yard out on a back shoulder route from quarterback Matthew Stafford. However, Johnson caught just one other pass for nine yards, finishing the game as a non-factor on offense. Shutting down Johnson did not show in the box score for Woodson, but what did show up were Woodson’s seven tackles, two interceptions, forced fumble, fumble recovery, sack, and touchdown. It was a great performance for the 12-year veteran who now finds his name in serious contention for Defensive Player of the Year. What made the performance even more impressive was the fact that Woodson was playing without his cornerback counterpart Al Harris, who was lost to a torn ACL the week before against San Francisco. The thought was that the Lions would stay away from Woodson and pick on Tramon Williams on the other side, but Johnson was targeted 12 times on offense and Woodson limited him to just the two catches. On the season, Woodson has recorded 54 tackles, ranked third on the team, forced a team-high four fumbles and six interceptions, and also has two touchdowns to his name. A trip to Canton might be in the future for the former Heisman Trophy winner, but a DPOY trophy would sure help the resume. Someone who might not make it to Canton but is a shoo-in for the Packers Hall of Fame is Donald Driver, who made the most of his Thanksgiving with a seven-catch, 142 yard performance that included a touchdown catch as well. Awarded the Golden Gobbler by Joe Buck and Troy Aikman, the 11-year veteran continued his outstanding season that has him leading the seventh-ranked passing offense in all major receiving categories. It was Greg Jennings who received a major payday in the offseason and while some of Driver’s success can be attributed to the double teams and attention other teams pay to Jennings, Driver has made things happen on his own and has created his own success. Known as one of the toughest players in the league, Driver ranks sixth in the NFC in receiving yards at 34 years old. The five players in front of Driver average 24.6 years in age, and as Driver put it, “I may be old, but I play young”. The win put the Packers at 7-4 and on top of the NFC Wildcard, but the road does not get any easier from here on out. The last five games for the Packers include matchups against Baltimore, Pittsburgh, and Arizona with an NFC North rivalry game against Chicago in the Windy City. General Manager Ted Thompson might live and die with building through the draft and having young players grow during the year to contribute, but this year has been the story of Woodson and Driver, two veterans doing everything they can to ensure the Packers play in January. The Packers have to be feeling good about winning their last two games against the Dallas Cowboys and San Francisco 49ers, but they also received equally bad news when it was revealed that starters Aaron Kampman and Al Harris would miss the rest of the season with torn ACL’s. Not that injuries ever come at a good time, but the news came at a terrible time for a Packers defense that, after a poor showing against Minnesota and Tampa Bay, had strung together two solid performances before Harris and Kampman went down. Tramon Williams (L) and Charles Woodson are the new Packers' starters at cornerback. Both players went down on seemingly freak accidents where neither were involved in the play and, in Harris’s case, 30 yards away from the play. It was a “here we go again” moment for the Packers defense, who up to this point had avoided major injury from their defense. Last season, Cullen Jenkins, Nick Barnett, Atari Bigby, and Harris all missed time with injuries, leading to a 22nd ranked defense. In a season where the Packers had continued to become more comfortable as each game passed in the new 3-4 defense, new personnel will now have to step on the field and become acclimated even faster. The two players most affected by the injuries are certainly cornerback Tramon Williams and outside linebacker Brad Jones. 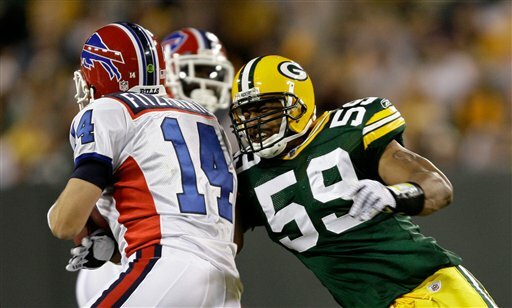 Williams, the fourth year nickelback from Louisiana Tech was the heir to Al Harris or Charles Woodson once either of them decided to hang the cleats up, but his number has been called earlier than he expected and he should to be up to task. More than the cornerback duo and safety combo of Nick Collins and Bigby, Green Bay’s secondary was considered one of the best in the league because teams faced three starting cornerbacks when they went with three wideouts. Williams was the reason why. At 27, Williams is in the prime of his career and is arguably the Packers’ best bump n’ run cornerback. The drop-off from Harris to Williams will not hurt the Packers exponentially, but the real problem is the lack of depth the Packers now have in the nickel and dime spots. With Williams moving up to the starting role, one of Jarrett Bush or Brandon Underwood will take over the third cornerback role. Both are liabilities but have shown flashes of being able to get the job done. Brandon Chillar coming back in a few weeks will help the cause and newly signed Josh Bell could compete as well. Brad Jones will be expected to get after the quarterback now that Aaron Kampman is gone for the year. At the outside linebacker spot, rookie Brad Jones will likely step in for Kampman. Jones, a seventh round selection out of Colorado, started against the Cowboy as Kampman was unable to go with a concussion. He played well and finished the game with seven tackles and also racked up two tackles after subbing in for Kampman against San Francisco. It is still a step down from Kampman, but Jones did a fine job getting after the quarterback and his speed will help in the pass defense more than Kampman would have. The Packers’ first test will come tomorrow against the Lions, and while no game should ever be overlooked (see Tampa Bay), it will help the Packers work their new starters into the defense. After that, the defense will have 11 days to figure out what is going to work and what needs to happen for the Packers to have continued success without two of their best defenders. Replacing 92 tackles and two veterans in a span of four days will be no easy task for Dom Capers and the Packers’ defense, but both Williams and Jones have been on the field for a good amount of time already and have both started a game. It is definitely something to look for in tomorrow’s game, regardless of the opponent. This article originally published on www.stadiumjourney.com. Stadium Journey judges sports stadiums around the country and rates them based on seven categories known as F.A.N.F.A.R.E. Rankings are 1-5, meaning scores closer to 35 are better stadiums, with lower scores being poorer stadiums. Without further adieu, here’s my review of Lambeau Field. There are few things better than a bratwurst and a beer in Wisconsin, and Lambeau Field’s food is no exception. The Gridiron Grill and Goin’ Deep Pizza feature an array of food items ranging from Johnsonville bratwursts or Italian sausages to pepperoni pizza. The Munch Zone provides such items as pretzels and nachos, all tasty in their own way. Beer is at a premium here and the “Leinie Lodge” is a place that all drinkers need to check out. It sits just outside the concourse, in a heated area with TV’s to watch the game and every kind of Leinenkugel Beer on tap in a cabin-type hut. The lines are what you would expect out of a 72,000+ seat stadium, but nothing that won’t get you back to your seat before halftime is over on most Sundays. If there were any 6’s to hand out, Lambeau Field’s atmosphere would warrant one. After driving through neighborhoods with tiny, one-story houses, the Mecca of professional sports jumps right out at you. Tailgating and parking in backyards start the trip and bars have live bands in the parking lots that make it a truly one-of-a-kind experience. Inside the stadium, the bowl-shaped architecture gives it a college football feel and just knowing the great players who played and the games that occurred inside the stadium give it a chilling feel as you walk up the tunnel. It’s truly something every sports fan needs to experience before they die. For the die-hard tailgater, Lambeau Field and the city of Green Bay offer an experience like none other. Plopped down in the middle of a rural neighborhood, bars have been erected that give it a more urban feel but the majority is still parking and tailgating in backyards of people’s homes. Kroll’s West is known as a hot spot for bar-goers and the atmosphere there is great with a crowded parking lot listening to music outside, to a great bar and restaurant scene inside. As for the tailgating, it’s everything you could ask for. For the most part, someone will be tailgating on either side of you and will be more than willing to lend you an item or two that you may have forgotten. Games of catch go on everywhere and it’s an overall friendly atmosphere, even for the away fan. Nowhere else in sports will you find a neighborhood quite like this one. Unless you live under a rock, you know that the cheeseheads are some of the most famous fans in America. No one loves their team in the same way that Packers fans do. In a rural city, the Packers are all that these people have and their devotion is second to none. All the way from Saint Vincent to the Bikini Girls, to the 300+ pound guy who goes shirtless no matter what, there are some darn good characters at the games. The only problem with the fans is that their homerism bleeds through sometimes, booing at obvious penalties and being way too hard on the coaching. Access to the stadium is excellent. As I mentioned before, Lambeau Field is surrounded by a neighborhood that lets fans to park in backyards. Because of that, the stadium is never more than a 5-10 minute walk from your car and lots cover about ¾ of the area around the stadium if you want to park there as well. When the weather gets cold, bathrooms are heated and make for a great trip to warm up and do your business at the same time. The new renovations increased the number of bathrooms, so outside of halftime there is rarely a wait. Leaving the stadium can be tough because of the neighborhood setting, but nothing different than any other stadium where 70,000 people are pouring out at once. The Packers are under the average for Fan Cost Index, and when you really think about the stadium you are entering, it makes it all worth the while. The Packers rarely raise prices and good seats can be found everywhere due to the bowl structure. Each seat is basically the same and there are no levels to obstruct views or get crowded. The experience at Lambeau Field is worth every penny. Lambeau Field’s renovation in 2003 added a lot to the already-famous stadium, including the Lambeau Field Atrium, the Packers Hall of Fame, and Curly’s Pub, named after Curly Lambeau, the founder of the Packers. The rich tradition is all around you in the Hall of Fame and they have Vince Lombardi’s office set up inside which is truly breathtaking for any fan. 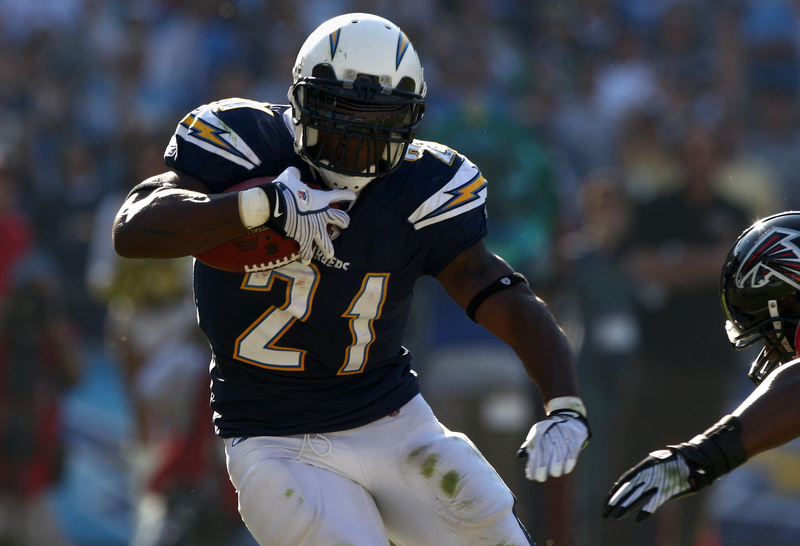 Entering Sunday’s game against the Eagles, LaDainian Tomlinson’s 2009 had been one to forget. Six weeks in, the Chargers were 2-3 and looking through binoculars to see the 6-0 Denver Broncos at the top of the AFC West division. Tomlinson had missed two of those games and had accumulated just 140 yards and caught five passes out of the backfield. Questions began to be asked on whether this was the same LT that we had been spoiled to watch the last eight seasons. After all, he had just turned 30, the breaking point for running backs, and spell running back Darren Sproles had signed a one-year tender the year before and looked as though “feature back” would be his new title. LT contemplated retirement and spoke of how he is beginning to cherish moments more because he knows he might be on his curtain call as an NFL player. For a guy looking to cherish the moment more, the scene at his locker before Sunday’s game against the Eagles should certainly be added to the list. As he entered the locker room, a purple bag sat in front of his locker. Inside was a positive pregnancy test that his wife LaTorsha had put there. Pretty special, right? Throw in the fact that LaTorsha had suffered a miscarriage four years earlier when the Tomlinsons were expecting their first child, and it becomes a tearjerker. LT called his wife as soon as he received the test and cried for five minutes on the phone, telling his wife how amazing she was. Take note, Travis Henry: This is what a real man looks like. Forget the rap music or the pre-game chest bumps. LT had all the motivation he needed to go out and produce for his wife and unborn child. A season-high 96 rushing yards and two touchdowns later, LT and the Chargers were celebrating their fourth victory in a row and a tie in the AFC West in terms of record. For the eight-plus years he has been in the league, Tomlinson has been one of the most likable guys on the field. It if weren’t for the fact that he has found the end zone 131 times in his career, more AFC opponents would probably like him. The ultimate team player, LT will forever be remembered for his NFL-record 31 touchdowns in 2006. What might have gone over people’s heads was his post-game comment after he broke the record. Whoa, whoa, whoa…we made history? Yes, that’s the kind of guy Tomlinson is and has always been. He rarely trash talks or goes to the media to air his concerns. Rather, he speaks through that intimidating pitch-black visor and the lightning-quick cuts that we could watch for days on end. We sometimes hate to see good things happen to bad people, and we surely hate to see bad things happen to good people, but when good things happen to great people, it makes up for it all. That’s exactly what Tomlinson’s situation was last Sunday. LaDainian Tomlinson is everything you want in a football player on and off the field. Losing your first child in 2005 and your father in a car accident two years later is something none of us want to go through, but how much of a reward must it have been for Tomlinson to open that bag? With the Chargers sitting at 6-3 and a rejuvenated Tomlinson in their backfield, the Chargers look poised to make a playoff run. Turning points happen all the time for teams and players that make championships happen, and it looks as though Tomlinson just found his. Twelfth in rushing yards and third in total touchdowns, Tomlinson is a first ballot Hall of Famer because of what he has done on the field. Before this season, he had never missed more than one game. For a running back who has carried the rock over 300 times seven out of his nine seasons, that’s not half bad. His time might be running out, but there isn’t an organization out there that would turn Tomlinson away. The Chargers’ offensive line has struggled this season, and LT has taken some of the blame for lacking the speed he once had, but if the Chargers decide to decline the $5 million they have to pay him next season, he is sure to quickly find a new home. It’s one of the best feel-good stories that we could have heard, especially after hearing way too much about the Larry Johnsons and Allen Iversons of the world. Congrats on the 96 rushing yards and win over the Eagles, LT. But even more importantly, congrats on the news of your first child. To say you’ve earned it is an understatement. My 200th Post: A Big Thank You to Everyone! 199 posts have come and gone, and Strotty’s Blog now finds itself writing its 200th post. Since I did nothing all that special for my 100th post (an article on the Packers extending Greg Jennings’ contract), I thought I would go through and thank everyone for helping me get to where I am today. For me, it wouldn’t be fair to start a thank you note without first mentioning my dad. Above anyone else in the world, yes that includes you Brett Favre, he has been my ultimate and absolute passion for sports. From including me on trips to Packers games to telling me to find something I loved and pursue it to the fullest, the person I am today is because of him. As a youngster, he would watch Monday Night Football and leave the TV room door open, knowingly or unknowingly, which let me watch the game from the hallway until my mom caught me. He coached just about every little league team I ever played for and once took a visit to the mound just to let me know I could throw at my grade school rival. He shares the same passion as I do for sports and is the main reason I am where I am today. If dad is 1A, then consider my mother 1B when it comes to who I am today. Everyone is supposed to say that they have the greatest mom in the world, but only my three brothers and I are telling the truth when we say it. She might not completely understand what I write on, but you can bet she’s the first to read it. When I was younger, she was the one telling me where my baseball uniform was as I frantically raced through my house before my ride came. She was the one given the task of cleaning my football practice uniform and was truly the one behind the scenes that made the Strotman boys function on the field. Speaking of the Strotman boys, next on the list of thanks are my three brothers. Starting with the oldest, Jack has been my role model since before I can remember. As my only older brother, I looked up to him and he did a perfect job of showing me the right way. He is also credited with teaching me how to play sports by practicing with me in the backyard, so thanks for that Bigten. The last of the Strotman brothers that I have to thank is 14-year-old Luke. Where do I even start? I guess I’ll begin by saying that he is my hero and has been the inspiration for everything I do in life. Until you meet Luke or hear his story of being a two-time cancer survivor at age 14, you can’t understand what I mean. Being his bone marrow donor has given us a special bond that will never be broken and I could not feel more honored. “Small but mighty” were the words on a shirt given to Luke, and it’s the perfect slogan for him. Yes, he’s small in size because of the effects the cancer had on him, but the true amazement is that his huge heart fits inside that small of a body. I hope he knows I’ll always be there for him whenever he needs it and that, yes, he can keep the blood I gave him even if the Cubs win the World Series. My family has been amazing in their support of my work so I’d also like to thank my grandparents, aunts, uncles, and cousins who have supported me through everything. There’s no substitute for family and I’d be nowhere in life without all of you. Other friends that I need to thank include Mike Fowler, my partner in crime for countless years in Holy Cross Basketball and CYO. 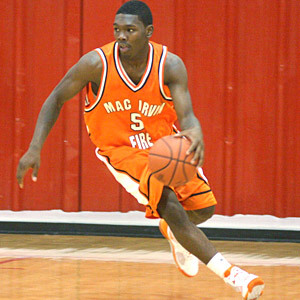 HC’s finest backcourt if I do say so myself. 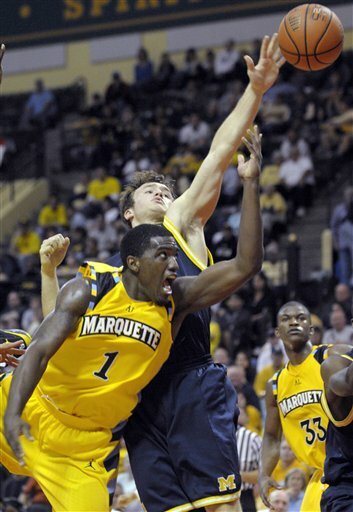 Kevin Shanley and Greg Smith, my future roommates, are a big part of why I love Marquette. Sports debates are a common occurrence with them, but it’s part of why I love sports. I wouldn’t trade those guys for the world. Friends and family have been instrumental to where I am today, but the blog still had to be written! I started the blog on February 10th on my iPod Touch while in Sociology of the Family class. Sorry, Mrs. Williams. I literally typed in “how to start a blog” on Google and clicked the first thing that came up, WordPress.com. From there, Max Tcheyan found my blog on WordPress.com about a month later and asked me to begin writing for Bleacher Report. I found a lot of success on B/R and it seems to have grown every month since I have been there. The majority of people reading my work find it on Bleacher Report. From B/R, Larry Garot of PackerChatters.com and BrewerChatters.com stumbled upon my work and asked me to begin writing for them. There are a lot of opinionated fans on the site who like to discuss, debate, and argue my work and it has given me a lot of insights on the Green and Gold. After writing for those three sites for a while, Garot approached me and said that Examiner.com was looking to fill a paid position for the Packers on their website. I did not hesitate to take the job and received my first paycheck from them about two weeks ago. After Examiner.com, ESPNMilwaukee.com asked me to submit my work to them and they posted it as a link for their Packers Updates in the off-season. It was truly an honor to write for them and I hope to continue my work with them in the future. As the Marquette basketball season rolled around, I was then approached by John Dodds from MarquetteHoops.com, a FOX Sports affiliate, to join their staff. This has been my first real “media” action as I have attended media day, press conferences, and will get to sit court side for a few games this season. That’s pretty much the story of how I got where I am today, so I’d like to thank Max Tcheyan, Larry Garot, Steve Harbula (of Examiner.com), and John Dodds, amongst others who have helped me get to where I am today. 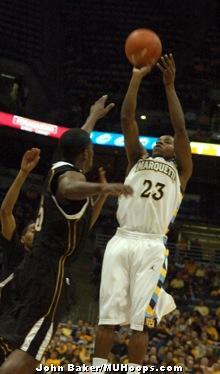 I also want to thank Pat Lawton, a good friend of my dad, who really “recruited me” to Marquette. 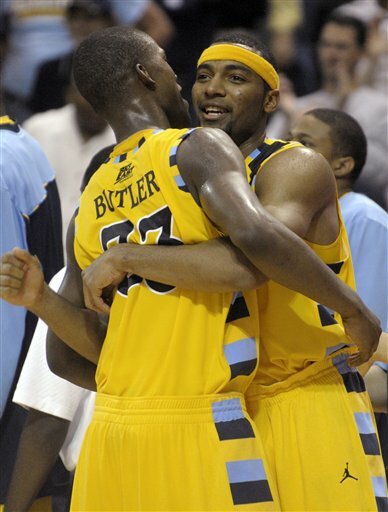 When he found out I was interested in Marquette, Mr. Lawton brought me along on Marquette’s NCAA Tournament trip to Anaheim and showed me a wonderful time. 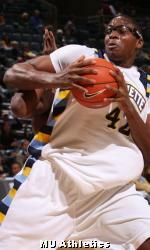 A lot of the reason I am at Marquette and having an unbelievable time is because of him. He has gotten me in touch with a lot of people at Marquette and helped my blog grow. He is a great contact to have, helping me whenever I need it, and I hope to have him there for a long time. The last thank you I want to give is to Steve “The Homer” True, voice of the Golden Eagles basketball team and a radio host for ESPN Radio. I visited him as a senior in high school for a school project, and as we talked about what it meant to be a great sports analyst he mentioned that if I didn’t have passion for what I was doing, I had nothing. From that point on, I kept in contact with him and sent him my work. He gave me constructive criticism and a boatload of confidence that I have continued to use in everything I do. I hope to have him as a mentor for as long as I write and talk about Milwaukee sports, so thank you Homer. I had to keep this thank you somewhat short, so if I forgot to mention someone in this let me know. Even if your name is not in here, I thank you. To date, Strotty’s Blog has 28,951 views, my work on Bleacher Report has 75,036 views, and my Packers material on Examiner.com has generated 6,737 views. These numbers are humbling and I am beyond grateful for everyone who reads my work. I still have a lot of work to do before I consider myself a great writer, but the people mentioned in this thank you are a big reason why I know I can accomplish the goals I have set for myself. Thanks to all the fans and people who read my work and I hope you continue to do so.